I haven’t been a big fan of vibrant colors for myself. I love the look on others, but I always thought I was too “low-contrast” – pale hair and pale skin – to look great in brights. And I still don’t like many brights next to my face, like vivid yellow, orange, green, or bold colorful prints. 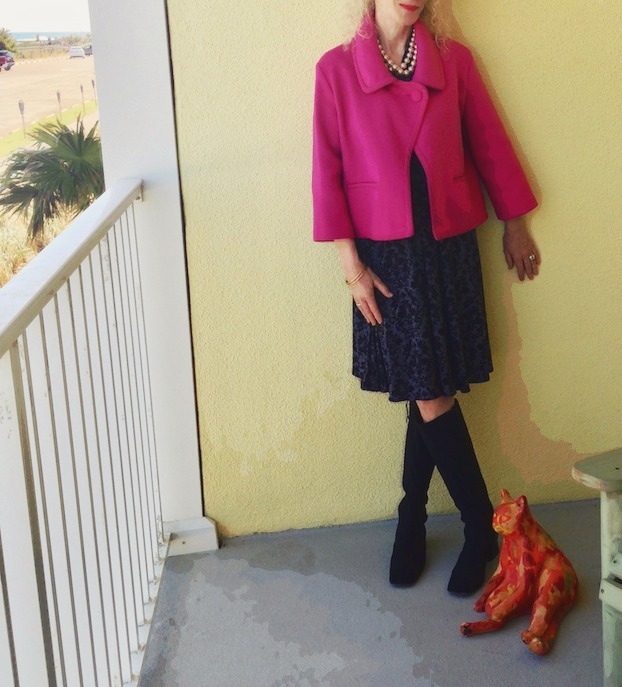 This hot pink jacket by Cynthia Rowley is one of the pieces changing my mind. I picked it up at Housing Works thrift in Chelsea for about $30, a great find. I wrote about it here, calling it a new “key piece” for my closet. I can always fall back on my navy or black blazer but this one makes me happy. For me, one bright color per outfit is enough – some fabulous blogger friends would call it a starting point, and add lots more glorious color. Pink must make me feel like dancing. 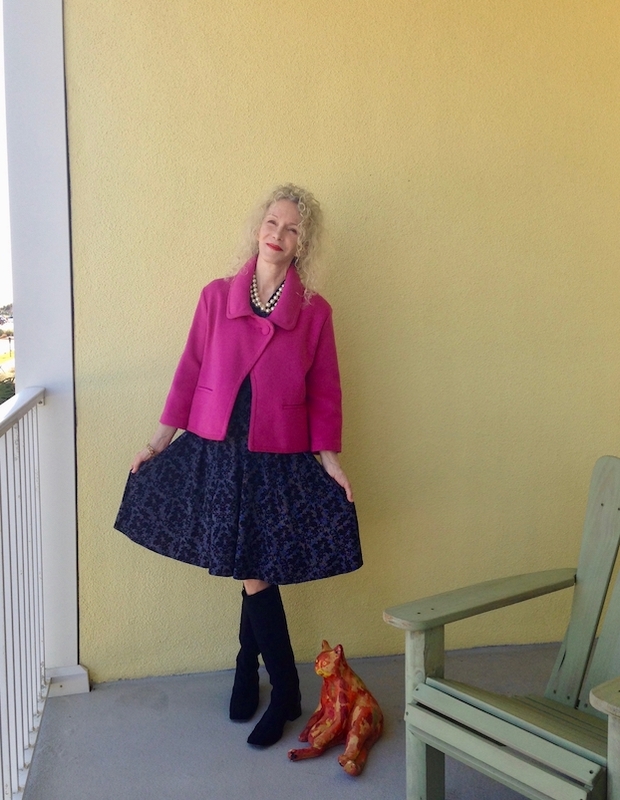 The remainder of the look is neutral, but not dull: a wonderful wrap dress from Karina, and thrifted Donald J. Pliner knee boots (similar). Faux pearls (sim) and red lips – I’ll wear red lips with any color outfit – and we’re done. Love the blazer, and the boots are great too! Love that bright pink jacket on you! This is a happy color for me, too. I have a pink outerwear jacket and have noticed that when I wear it, strangers seem more likely to smile at me. Maybe pink is seen as a friendly, approachable color. Have you noticed your pink jacket having a similar effect on people? OMG Love it. The jacket looks fabulous on you both color and cut. Keep it up expanding those horizons. It’s good for us! The jacket is lovely and really suits you. I like the shorter length and button fastening at the top. The pearls finish off the outfit beautifully. That shade of pink is just amazing and it looks great on you! I think this colour looks terrific on you. I know I am a big fan of this bright pink/fuchsia but it also looks good on you. I love the way you styled it. Totally my taste. Skirts of this length suit you fine. The pearls are the cherry on the cake. You know how I adore you in colour. The cut and shape of the coat is wonderful. I have that same Karina dress! Beautiful, bright pink jacket! This vibrant color looks lovely on you. I’m with you – one pop of color is enough for me. I love this look, such pretty pieces and all looking wonderful together. The colour is gorgeous on you, and the shape of the jacket is very cool. Definitely a staple piece for your wardrobe, and from New York too, which makes it even better! What a fabulous jacket. That color makes you sparkle! Wow, great jacket. Pink looks good on you. I kept forgetting about Visible Monday until like Wednesday or Thursday but yay for me I remembered on Monday! Patti, I think with your coloring you could wear brights b/c you are so fair like me but understand if you felt overwhelmed by them. And, girl, you don’t want to be overshadowed by anything anymore! You wear color like no other Patti!!! That jacket looks fabulous on you! Love the color and the cut. A beautiful colour on you. If you had your colours “done,” you would probably be a winter. Not only is the color beautiful on you Patti, but the cut of that jacket is fabulous…love it! Glad to join you in your vibrant colours once more, dear Patti. Patti, I love this jacket on you! Such a flattering cut and color for you. What a great find! I have to say, I’m one of those that thinks it’s a great starting point Patti!! I feel like it really makes you stand out in a crowd—which you certainly do with your wonderful thoughts and comments, but now also with that jacket!! Patti, I’m drooling over that jacket! You look wonderful today. But wait — no green? That’s the color I sketched you in for Fashion Rainbow! You wore it at least once, I swear! (Green A-line tunic over a black skirt, March). Your post topic matches up with ours today beautifully! We are celebrating color as well and I love your jacket. You look wonderful in that shade of pink, Patti! And I really love the shape of the jacket! It’s a great piece for sure! Aas on of your blogger friends, YAY!!! It’s the perfect staring point, this color is fabulous on you. Wonderful way you styled it with your navy dress and then pairing it with those black boots. Yea, for bright colors. And here I even noticed you didn’t do them! Well, now you do and you look good. The color of your jacket is marvelous and you look fantastic. Thanks for hosting and starting a new week of link ups. It is a very beautiful jacket, and goes with so many outfits. And the dress is super cute!